The beta Tubulin antibody from Proteintech is a rabbit polyclonal antibody to a recombinant protein of human beta Tubulin. This antibody recognizes human, mouse, rat antigen. 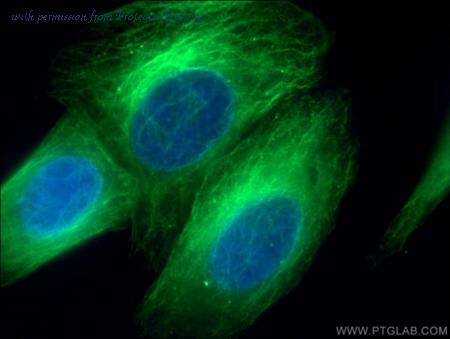 The beta Tubulin antibody has been validated for the following applications: ELISA, WB, IF, IP, IHC, FC analysis. The beta Tubulin antibody from Proteintech is a rabbit polyclonal antibody to a recombinant protein of human beta Tubulin. This antibody recognizes human,mouse,rat antigen. 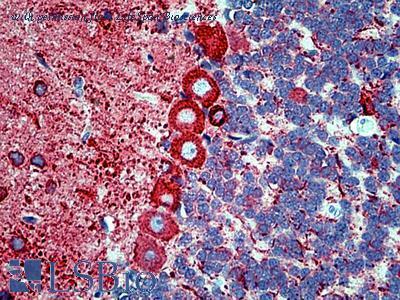 The beta Tubulin antibody has been validated for the following applications: ELISA, WB, IHC, IF, IP analysis. 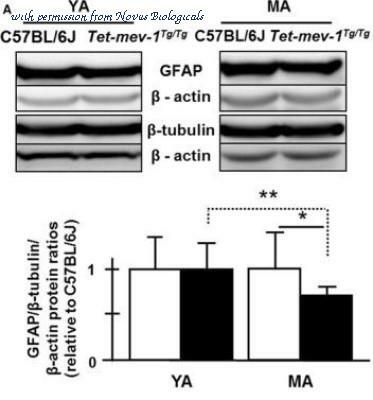 The beta Tubulin antibody from Proteintech is a mouse monoclonal antibody to a recombinant protein of human beta Tubulin. This antibody recognizes human, mouse, rat,nematode,pig,zebrafish antigen. 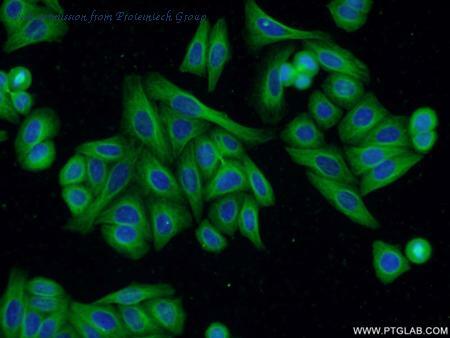 The beta Tubulin antibody has been validated for the following applications: ELISA, IF, IHC, IP, WB analysis. Immunocytochemistry/Immunofluorescence: beta-III Tubulin Antibody [NB100-1612] - Left panel: B-III Tubulin (Green); GFAP (Red); DAPI nuclear stain (Blue). 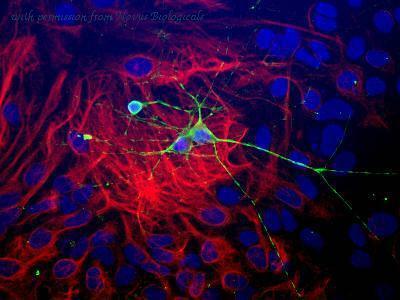 Immunocytochemistry/Immunofluorescence: beta-III Tubulin Antibody [NB100-1612] - Dissociated cell culture of a neonatal mouse brain showing beta-III Tubulin (green staining) of neurons. 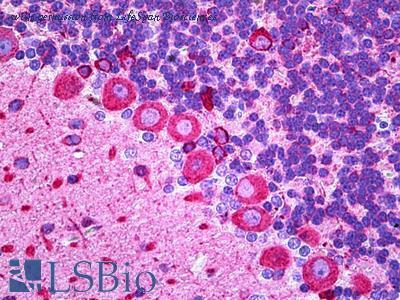 These cultures were counter-stained with a rabbit anti-GFAP antibody (red staining) to identify astrocytes, and with DAPI (blue staining) to localize nuclei. Western Blot: beta-III Tubulin Antibody (2G10) [NBP2-37816] - Analysis of 25 ug of various brain, SHSY5Y, and HeLa cell lysates and 10ul of PageRuler Prestained Protein Ladder. 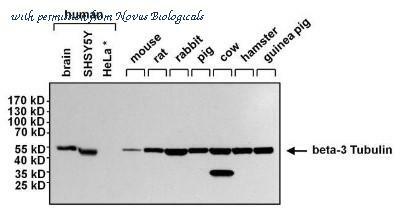 Western blot analysis of mouse placenta lysate using Claudin 1 antibody. Western Blot of Mouse Anti-Tubulin ß III antibody. Lane 1: rat cortex lysate. Lane 2: none. Load: 10 µg per lane. Primary antibody: Anti-Tubulin ß III antibody at 1:400 for overnight at 4°C. 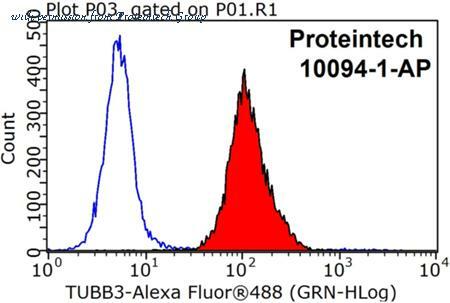 Secondary antibody: IRDye800™ mouse secondary antibody at 1:10,000 for 45 min at RT. Block: 5% BLOTTO overnight at 4°C. Predicted/Observed size: ~55 kDa for Anti-Tubulin ß III. Other band(s): Anti-Tubulin ß III non-specific.